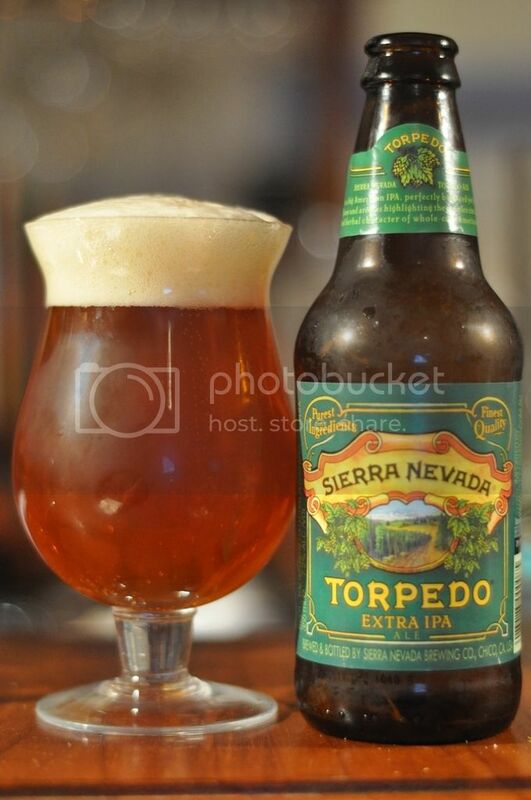 The Torpedo from Sierra Nevada is one of five beers the brewery brews year round. This is one of my favourite breweries and this is one of my favourite beers. It's been a really long day at work and this should be the perfect wind down beer. An American IPA is a hoppy style of beer, and a fuller flavoured variant on the English IPA style. IPA stands for India Pale Ale and was so named because it was initially brewed in England and transported to British troops stationed in India. The relatively high alcohol content was used to keep the beer fresh on the long journey, and remains to this day as a reminder to the history of this delicious beer style. This beer pours a brilliant deep amber colour, with hints of orange throughout the beer. There are good streams of carbonation rising to a perfect creamy looking head. The head retention is reasonable for the style but the lacing is superb. You are left with a beautiful spider-web of head left in your empty glass. The Torpedo is pretty close to the perfect looking IPA, it's a brilliant looking beer! The first thing you notice, almost when your pouring this beer is an incredible hop aroma. There is only the slightest hint of malt character but there are pine and citrus elements are present. It's slightly sweeter than I expected and this has to be due somewhat to the fruity nature of the hops, I think I'm smelling grapefruit or something similar. The hops also appear to have some bitterness, which helps make this beer smell seriously good! I honestly don't know what more you could ask for in an IPA! The Torpedo has a slightly sticky mouthfeel while being both bitter and sweet at the same time. Despite this sticky texture the beer remains refreshing, as any good IPA should be, because of the excellent hops used in this beer. These hops are strong and flavoursome without over powering the other elements of the beer. The grapefruit that was present on the nose is delicious and there are hints of other citrus flavours throughout the beer. It's a simply brilliant IPA! Sierra Nevada make so many good seasonal IPA's, the Winter Celebration springs to mind, and this one is no exception. In my opinion this is one of the best IPA's out there and certainly the easiest drinking of all of them. I'm quite happy to have this beer with dinner or even as a session beer (if a very expensive one..). Seriously if you've never had an IPA you need to try this beer, and if you like IPA's and haven't had this one, you need to go get one!